PASAY CITY – Sen. Francis “Chiz” Escudero urged the National Grid Corporation of the Philippines (NGCP) to start the implementation of the long-standing proposal to link the Mindanao power grid with the rest of the Philippines to avert a potential power shortage in Luzon that is being projected by the Energy Development Corp. (EDC) by 2018. According to Escudero, the EDC expects the demand for power to go up due to the country’s growing economy, which may impact on the energy supply to Luzon. With the projected over supply of electricity in Mindanao starting next year because of the completion of new power plants, Escudero said the Mindanao-Visayas power interconnection would make it possible to share the surplus power to Luzon. Power supply in Mindanao is projected to hit 13,300 megawatts (MW) by 2016 compared to a projected demand of 12,000 MW, according to the Department of Energy (DOE). Escudero said lawmakers have long been pushing for the link-up since discussion on Republic Act No. 9136 or the Electric Power Industry Reform Act (EPIRA) started in Congress 15 years ago. “We have been pushing for that since the EPIRA was being discussed in Congress in 2000. We’ve been proposing that already – the inter-connectivity and a truly national grid connecting the entire country’s power lines,” Escudero said. The independent vice-presidential bet, however, admitted that the government’s hands are tied on the issue since the NGCP is a private entity. “NGCP cannot be forced to hasten the implementation of the plan since it has already been privatized but the government can exert pressure, and that pressure would come from the fact that no new power plant in Luzon will be up by 2017,” Escudero pointed out. “It’s a stop gap solution but it is the only immediate solution to the impending power shortage in Luzon. Connect Luzon, Visayas and Mindanao through overhead lines and submarine cables so power could be brought from areas where there is a surplus of supply to places where there is a supply shortfall,” he added. The same solution could not be applied before to address the Mindanao power crisis because Luzon had only enough power supply for its consumers, according to Escudero. 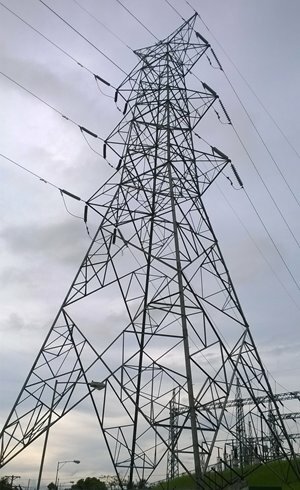 Recent reports said the NGCP is still completing the feasibility study on the Mindanao-Visayas power line interconnection but it has vowed to complete the project by 2018. NGCP said it has been studying two proposals that would make Dipolog City as the connection point to either Cebu or Negros Islands. The NGCP, which is responsible for bringing the electricity produced by power plants to distribution utilities, has thumbed down the original plan of having a Surigao-Leyte route because it’s situated near active fault lines. The said route, which would have spanned 455 kilometers of overhead lines and 23-kilometer submarine cables, is estimated to cost P24 billion. CHICAGO – Remembering the day, December 7th, 1941, a reason why we volunteered to save our country, our families. Not only did the Japanese unload its arsenal from the air on the Island of Hawaii, but also on the Philippines Islands as well that day. The surprise air bombardment annihilated the Navy's entire Pacific Seventh Fleet at Pearl Harbor within hours. Across the ocean the Japanese Zeros were also creating havoc destroying US bases in the Philippines, Guam and Midway. These aging Filipino WWII veterans continue to gather regularly to share their daily life struggles but most importantly to share in a bond of camaraderie with one another. After each gathering they have a merienda style of refreshments and then depart in all directions on their way home, hoping to meet for another community mission. Continuing on their agenda is the hopeful return of at least one of the three church bells removed from the Town of Balangiga, Eastern Samar in 1901 and is still a priority in their lifetime. Another great observance is Bataan Day, commemorated annually on April 9th when US Forces first surrendered the Town of Bataan and its soldiers in 1942 to the enemy, the Imperial Japanese Army. Our history and culture remains rich and alive because of the stories still shared by these gate-keepers, some may call Lolo. I am inspired and proud to call them our nation's heroes. 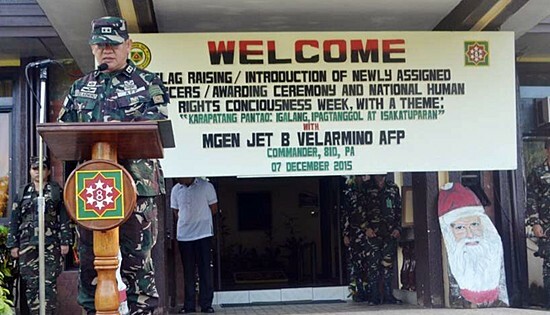 Maj. General Jet B. Velarmino AFP, Commander, 8ID while delivering his message during the Flag Raising Ceremony and commemoration of National Human Rights Consciousness Week on December 7, 2015. CAMP LUKBAN, Catbalogan City – The 8th Infantry Division, Philippine Army joined in the commemoration of the National Human Rights Consciousness Week during the Monday Flag Raising held at Division Admin Building today December 7, 2015. The celebration bore the theme: “Karapatang Pantao: Igalang, Ipagtanggol, at Isakatuparan” was spearheaded by Major General Jet B Velarmino AFP, Commander, 8ID. It was attended by the officers, enlisted personnel and civilian employees of the Command. Brigadier General Demy T Tejares, Assistant Division Commander, 8ID, PA as Human Rights Officer, led the troops in the reading of Panata sa Karapatang Pantao. “As we pursue our sincere commitment, I am very aware and respectful of the role of every ‘Stormtroopers’ to the society and various stakeholders’ effort to broaden people’s awareness on their human rights,” Major General Jet B Velarmino in his message. “It is our duty and mandate to protect and put an end to this impunity and cultivate a culture of respect to human rights in all levels of our Command,” Velarmino added. MANILA – The Philippines Commission on Human Rights (CHR) announced that it will launch an investigation on December 10 (International Human rights Day) which could hold fossil fuel companies responsible for the impacts of climate change, such as extreme weather events. This will be the world's first national human rights investigation into big polluters. The 50 companies that will be investigated include Chevron, ExxonMobil, BP, Royal Dutch Shell, ConocoPhillips. They are a part of the 90 legal entities that are responsible for the majority of global CO2 and methane emissions in the earth’s atmosphere, as identified by peer-reviewed research into so-called ‘Carbon Majors’ published in 2014. “The response of the Philippines’ Human Rights Commission to the petition signals a turning point in the struggle to avoid catastrophic climate change. It opens a critical new avenue of struggle against the fossil fuel companies driving destructive climate change,” said Kumi Naidoo, the International Executive Director at Greenpeace International. The CHR disclosed in a press conference on 4 December in Paris that it’s investigation will involve all stakeholders including the 50 corporations, and include consultations and studies. As triggered by the petition, it will organize an investigation committee devoted to climate change and human rights. “This investigation is not just about how fossil fuel companies do business, but that they do business at all in the future. It’s time we held, those to account who are most responsible for the devastating effects of climate change,” said Zelda Soriano, legal and political advisor at Greenpeace Southeast Asia. “We’re absolutely behind the Commission on Human Rights in seeking the opinion and cooperation of UN human rights experts and scientists, and its courageous investigation into these distant and faceless companies,” adds Zelda Soriano, legal and political advisor at Greenpeace Southeast Asia. - to recommend to the government that it provides human rights mechanism where victims of climate change can be monitored and assisted. PARIS, France – While world leaders and negotiators continue to meet in Paris to address the global climate crisis, on the Youth and Future Generations day at the United Nations Convention on Climate Change (UNFCCC) 21st Conference of Parties (COP21), Filipino millennials demand parties to address the worsening effects of climate change through an ambitious and strong agreement to limit and reduce greenhouse gas emissions. “Climate change is a social justice and human rights issue and demand that the Government of the Philippines in cooperation with all parties to the UNFCCC to come up with an ambitious, party-driven, gender-sensitive and participatory climate agreement,” the statement declared. “We held workshops and consultations across the country explaining not only the basics of climate change, but the basics of climate policy and the negotiation process as well. In these sessions, participants were divided into four workstreams – adaptation, mitigation, climate finance and capacity – building – and asked to identify three to five priorities that they believe the Philippines as well as all parties to the UNFCCC should put forward in COP 21. Emulating the negotiations, the youth leaders were given time to meet with their groups to lobby for matters they thought most urgent,” said Rodne Galicha, Philippine manager of Climate Reality Project, a global movement founded by Nobel Laureate and former US vice president Al Gore with a mission to catalyze a global solution to the climate crisis by making urgent action a necessity across every level of society. “From 2015 and COP 21 onwards, The Filipino Youth Statement on Climate Change will be the annual culmination of Climate Reality Project in the Philippines’s youth campaign. Aside from its policy advocacy and climate education efforts, we seek to properly represent the youth sector in the climate negotiations by providing areas for dialogue and collaboration between the youth and civil society, government, and the Philippine Delegation to the climate talks,” said Galicha. “We affirm our responsibilities as stewards of the environment, and recognize the need for participation in this global effort. We commit to act in our communities, and support the government and other agencies in programs for sustainable development,” said Tuson. The Filipino Youth Statement on Climate Change 2015 submitted to the National Youth Commission, Climate Change Commission and the UNFCCC Secretariat, reiterates the human rights approach to the negotiations, emphasizing that it is a moral imperative to bring to light the plight of women, children, people with disabilities, indigenous groups and marginalized communities as they are rendered twice vulnerable by climate impacts. 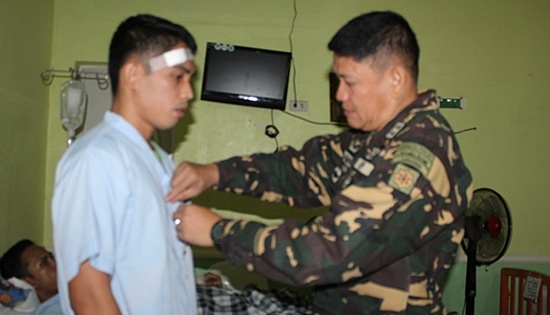 Maj Gen Jet B. Velarmino AFP, Commander, 8th Infantry Division, Philippine Army while pinning the medal to a wounded soldier of 14th Infantry Battalion in a ceremony conducted at Camp Lukban Station Hospital on December 1, 2015. CAMP LUKBAN, Catbalogan City – Eight soldiers who were wounded in separate clashes last November in Samar were awarded with wounded personnel medal and cash assistance for their bravery and selfless service under the 8th Infantry Division, Philippine Army in a ceremony, Tuesday morning, December 1. Two soldiers belonging to the 63rd Infantry Battalion, two soldiers from 87th Infantry Battalion and three soldiers from the 14th Infantry Battalion, 8th Infantry Division, Philippine Army received the medal and cash assistance in a ceremony held at Camp Lukban Station Hospital, Headquarters 8ID at 8:30 a.m. The Wounded Personnel Medals were awarded by Maj. Gen. Jet B. Velarmino AFP, Commander 8th Infantry Division, assisted by Brig. Gen. Demy T. Tejares, the Assistant Division Commander and Col. Divino Rey C. Pabayo Jr, the Chief of Staff. They also gave cash assistance and assorted fruits to the eight wounded in action soldiers. 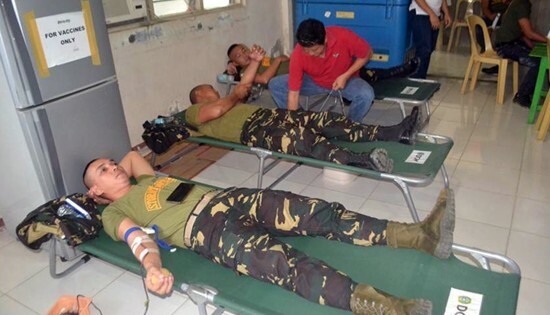 The two personnel of 87th Infantry Battalion namely: Cpl Jonas C Autor and Pfc Nico Basibas, were wounded in an encounter with more or less 15 New People's Army (NPA) rebels at Barangay Buluan, Calbiga Samar at around 6:00 a.m. on November 25, 2015. The encounter resulted to the death of one unidentified NPA member, seizure of an enemy encampment with 18 enemy bunkers, one multi-purpose hall and one classroom and the recovery of 200 rounds of K3 squad automatic weapon ammunition, one memory card, one binocular and other subversive documents. The other soldiers namely: Pfc Pablito Pomarca and Pfc Eric Lazara of 63rd Infantry Battalion were wounded during an ambush perpetrated by NPAs at vicinity Barangay Washington, Catarman, Northern Samar at about 3:28 p.m., on November 24, 2015. Four other soldiers, namely: 1lt. Cherwin B. Lapura, Pfc Rey D. Calabroso and Pfc Jack O. Macatantan of 14th Infantry Battalion were wounded during an ambush with more or less 20 NPA members at Barangay Lagundi, Catbalogan City, Samar last November 27, 2015 and Staff Sgt, Wilfredo T. Irasgaof the 20th Infantry Battalion who was wounded in enemy attack at Barangay Bonifacio, Gamay, Northern Samar while conducting peace and development operations last October 20, 2015. While pinning the medals to the wounded troops, Maj. Gen. Velarmino said: "Your bravery in carrying out your assigned task is remarkable and worth emulating by other soldiers. With that, I would like to extend my congratulations to all of you for a job well done in protecting the people to the extent of risking your lives. Restructured Reenlistment Training (RRT) students of 8ID, PA together with the city health workers headed by Dr. Gerarda Tizon, during the Blood Letting activity at Pier 2, Catbalogan City on December 1 which was organized by the Catbalogan City Health Office in support to Worlds AIDS Day. CAMP LUKBAN, Catbalogan City – The 8th Infantry (Stormtroopers) Division, represented by the Restructured Reenlistment Training (RRT) students of the Division Training School (DTS), participated and provided support and assistance to the Blood Letting Activity organized by the Catbalogan City Health Office held at Pier 2, Catbalogan City on December 1, 2015. The said activity is in support to the World AIDS Day celebration of Catbalogan City dubbed as "Zero HIV Transmission Through Safe Blood Donation: Be a Blood Donor" was also participated by local government agencies of Catbalogan City, Philippine National Police (PNP) Catbalogan City, ROTC Students of Samar College and barangay residents of Catbalogan City. It was facilitated by the City Health Office as organizers headed by Dr. Gerarda C. Tizon, the City Health Officer. Major General Jet B. Velarmino, Commander 8ID, encouraged everyone to participate in activities like this in order to strengthen the spirit of “Bayanihan” which is the trademark of every Filipino. This activity is just part of the efforts of the City Health Office for its continuing community relation service in cooperation with Local Government Units, Local Government Agencies, Private Sectors and Stakeholders. 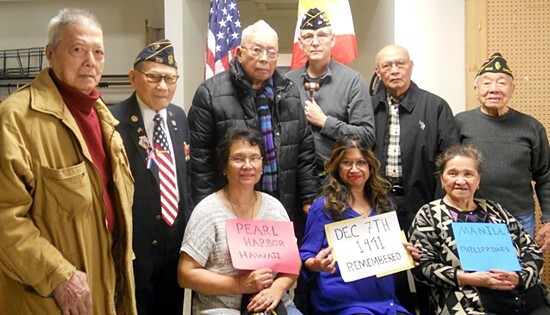 CHICAGO – Early morning on Veterans Day, one of Balangiga Bells staunch advocate for recovering the historic church bells is Filipino WWII veteran Jaime Pesongco. He began his day by visiting the local IHOP Restaurant in Wrigleyville. In his American Legion attire, he was greeted by many patrons thanking him for his service and contribution. WWII vet Pesongco also thanked other veterans seated among the early breakfast crowd from different campaigns such as Korea, Vietnam and the Iraq wars. The IHOP franchise served him up their fancy Red, White & Blue Pancakes with eggs and beacon on the side, complimentary to all veterans on that special day. Then off to the JB-VA Medical Center to hear the program put on by other veterans and guest. This would be the first indoor event attended, in the past he was always at Soldiers Field with a program hosted by the City of Chicago. Due to brisk temperatures in November along the lake front, it was best not to sit outside in the cool weather for the hour long event as in years past. Hosting the VA program was Connie's Pizza, boxes towering tall, serving a variety of their famous pizzas to the veterans. The pizza chain has been known to cater to Chicago sports events in the area when teams are in season. 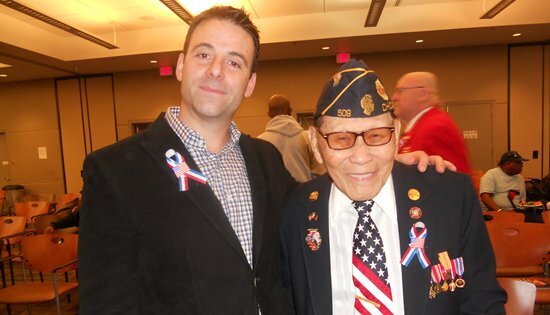 Ninety-five year young WWII vet Jaime Pesongco made it a point to personally extend his gratitude of appreciation to Connie's Pizza owner/president Mr. Michael Stolfe for not only being a valuable host but most importantly for his presence and camaraderie on Veterans Day 2015 at the JBVAMC. PASAY CITY – Sen. Francis “Chiz” Escudero said the government should come up with incentives to encourage renewable energy developers to invest in areas that remain without power and at the same time, help the country fulfill its pledge to address climate change. Escudero made the proposal as the Philippines commits to a global effort to reduce the world’s carbon emissions at the 21st Conference of Parties (COP21) to the UN Framework Convention on Climate Change in Paris. The Philippines chairs the Climate Vulnerable Forum, a group of 20 nations most vulnerable to the impacts of climate change. “If we are serious about reducing carbon emissions and making good on our international commitments, then we should push for the development of renewable energy sources,” Escudero said. The Department of Energy (DOE) estimates that the Philippines will need an additional 11,400 megawatts of generating capacity to meet the demand for electricity from 2016 to 2030 – an opportunity for power producers to consider renewable energy development, the senator said. Escudero, who heads the Senate Committee on Environment and Natural Resources, said renewable energy sources are not only sustainable but cheaper than fossil fuel because the sources, such as wind and sunshine, are virtually free. Unfortunately, as of 2014, only 37 percent of generated power was supplied by renewable sources while 63 percent came from non-renewable energy, mainly coal, according to DOE data. Of the renewable sources, less than one percent was from wind and solar energy. “It’s pitiful. We have the resources that we need right here that can solve our problem of insufficient, unreliable and expensive power supply. But we’re not developing them, so we have to ask ourselves: why isn’t there enough interest in this business?” Escudero said. Escudero, who is running as Sen. Grace Poe’s vice president, said the government should study the possibility of giving tax incentives to companies that would go into renewable energy development, especially in areas with power problems like Mindanao. He also proposed conducting a nationwide survey to identify which provinces could be tapped for various renewable energy projects. He said the government should exhaust all means to bring affordable electricity to some 15 million Filipinos who still have no electricity in their homes. “It is time to harness the resources that we have to produce the energy that we need. Otherwise, we will forever be at the mercy of the big power firms who control the supply of power, and hence, the amount that we pay for electricity,” the senator said. Philippine households pay the fifth highest power rate in the world, according to the International Energy Agency. In 2011, households here paid $ .2460/kWh for electricity, only slightly lower than Denmark’s $.3563/kWh, the highest electricity rate in the world for residential consumers.